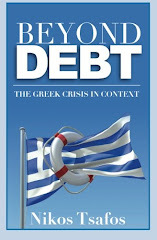 In 2010, Greece will lower its government deficit from 15.4% of GDP to 9.4%. The press routinely criticizes the government for not doing enough, for being too slow to reform or for not collecting enough in taxes. But give the government its due: the fiscal consolidation of six percentage points in 2010 is unprecedented by European standards. To put Greece’s accomplishment in perspective, I looked at how much other countries have cut their deficits in the past. For comparison, I took the EU members since 1995 (if a country joined after 1995, I only took the years since accession). For every year, I calculated the change in the fiscal position of the government: for example, in 1997, Germany’s government deficit was -2.6% of GDP, while it was -3.3% in 1996. So in 1997, Germany reduced its government deficit by 0.7 percentage points. Since 1996, there are a total of 269 observations (some data is missing for earlier years). When you look at this entire set, almost half of the observations (126) return a value below 0. So in 47% of cases, a government’s fiscal position got worse in a given year (meaning the deficit rose). Much of that is due to the worsening fiscal position of countries in 2008 and 2009 as the crisis hit; of the 126 observations, 49 occurred in 2008 and 2009. 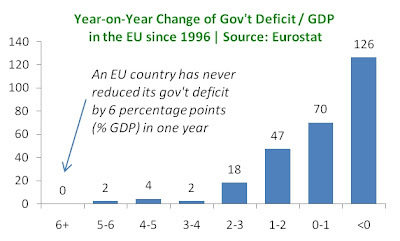 Now look at the other extreme: there are only eight cases of countries that reduced their deficits by more than 3 percentage points: Sweden (1996), Italy (1997), Finland (2000), Czech Republic (2004), Malta (2004), Denmark (2005), Cyprus (2007) and Hungary (2007). Importantly, in none of these cases was the euro the official currency. This is, then, the context for the fiscal consolidation of six percentage points that Greece is making in 2010. Obviously, the fact that no other EU country has done this before is in part due to the fact that no other country has let its deficit get so completely out of hand. Still, there are several observations of countries faced with deficits above 5% of GDP even prior to the 2008-2009 crisis. Greece’s challenge, of course, is just beginning and a deficit of 9.4% of GDP is still enormous. But more credit should be given to the fact that the government has pulled off an amazing feat in 2010 – and for that, it deserves praise. Is Greece Leaving the Euro Good for the Euro? Is Leaving the Euro Good for Greece?